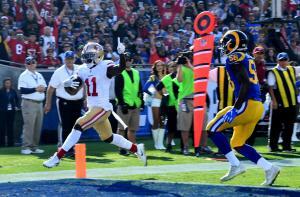 March 8 (UPI) — The San Francisco 49ers have signed wide receiver Marquise Goodwin to a three-year contract extension. San Francisco announced the pact on Thursday afternoon. Sources told NFL Network that the deal is worth $20.3 million, including $10 million in guaranteed cash. “From the minute Marquise joined our team, he has shown us everything we want to see in a 49er,” general manager John Lynch said. Goodwin, 27, had a career year in 2017, hauling in a career-high 56 receptions for 962 yards and two scores in 16 starts for the 49ers. He joined the franchise in free agency last offseason after spending the first four years of his career with the Buffalo Bills. The 5-foot-9, 179-pound pass-catcher ranked third in the NFL with an average catch of 17.2 yards. Goodwin also won the team’s Len Eshmond Award, an honor voted on by 49ers players to the player who best exemplifies the inspirational and courageous play of Len Eshmont. He also won the team’s Ed Block Courage Award, given to the player who best exemplified a commitment to sportsmanship and courage. Goodwin was a third round pick in the 2013 NFL Draft. He was also a member of the 2012 United States Olympic team and a two-time NCAA long jump champion. He was a seven-time All-American and a five-time Big 12 champion long jumper at the University of Texas.